Giamatti at the 2013 Toronto International Film Festival. 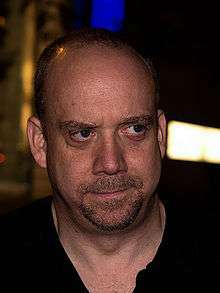 Paul Edward Valentine Giamatti (/dʒiəˈmɑːti/; born June 6, 1967) is an American character actor and producer He was nominated for an Academy Award for Best Supporting Actor for the film Cinderella Man and is also known for his roles in the films Private Parts, Sideways, American Splendor, The Illusionist, Cold Souls, Barney's Version, Big Fat Liar, Love & Mercy, Straight Outta Compton, and Win Win, as well as the miniseries John Adams and Downton Abbey. He has won two Golden Globe Awards, a Primetime Emmy Award and four Screen Actors Guild Awards. Giamatti was born June 6, 1967, in New Haven, Connecticut, the youngest of three children. His father, A. Bartlett Giamatti (Angelo Bartlett Giamatti), was a Yale University professor who later became president of the university and commissioner of Major League Baseball. His mother, Toni Marilyn Giamatti (née Smith), was a homemaker and English teacher who taught at Hopkins School and had also previously acted. His paternal grandfather's family were Italian immigrants from Telese Terme; the family surname was originally spelled "Giammattei" (Italian pronunciation: [dʒammatˈtɛi]). The rest of Giamatti's ancestry is German, Dutch, English, French, Irish, and Scottish. His paternal grandmother had deep roots in New England, dating back to the colonial era. His brother, Marcus, is also an actor, and his sister, Elena, is a jewelry designer. Giamatti was first educated at The Foote School and later graduated from Choate Rosemary Hall in 1985. He attended Yale University, where he was elected to the Skull and Bones secret society. He was active in the undergraduate theater scene, working alongside fellow actors and Yale students Ron Livingston and Edward Norton. He graduated in 1989 with a bachelor's degree in English, and went on to earn a Master of Fine Arts degree from the Yale School of Drama, where he studied with Earle R. Gister. He performed in numerous theatrical productions, including Broadway and a stint from 1989 to 1992 with Seattle's Annex Theater, before appearing in some small television and film roles in the early 1990s. In 1997, Giamatti landed in his first high-profile role as Kenny "Pig Vomit" Rushton in the film adaptation of Howard Stern's Private Parts. Stern praised Giamatti's performance often on his radio program, calling for him to be nominated for the Academy Award for Best Supporting Actor. In 1998, Giamatti appeared in a number of supporting roles in the big-budget films, The Truman Show, Saving Private Ryan and The Negotiator. In 1999, he played Bob Zmuda and Tony Clifton in Miloš Forman's Andy Kaufman biopic, Man on the Moon. Giamatti later continued steadily during the early 2000s by appearing in major studio releases including Big Momma's House, Planet of the Apes and Big Fat Liar. In 2003, Giamatti began to earn critical acclaim after his lead role in the film American Splendor. In 2004, Giamatti gained mainstream recognition and fame with the 2004 independent romantic comedy Sideways. His portrayal of a depressed writer vacationing in the Santa Barbara wine country garnered him a Golden Globe nomination and an Independent Spirit Award. Following the commercial success of Sideways, Giamatti appeared in Cinderella Man, for which he earned an Academy Award nomination for Best Supporting Actor. He was nominated for a Golden Globe and won the Screen Actors Guild Award for Best Supporting Actor - Motion Picture. In 2006, Giamatti was the lead in M. Night Shyamalan's Lady in the Water, a supernatural thriller, followed by the animated film The Ant Bully, and Neil Burger's drama The Illusionist co-starring Edward Norton. Giamatti had his first major role in an action movie in the 2007 film Shoot 'Em Up, while also starring in The Nanny Diaries and Fred Claus. In 2008, Giamatti received his first Emmy Award for Outstanding Lead Actor in a Miniseries or a Movie for his title performance in the HBO miniseries John Adams, a role that led to a Screen Actors Guild award. That same year, he starred in the independent film Pretty Bird, which is a fictionalized retelling about the drama behind the invention of a rocketbelt. Giamatti received his second Golden Globe win for his role in the 2010 film, Barney's Version. Giamatti starred as the lead in the comedy-drama film Win Win, which earned positive reviews from critics. The same year he had small roles in Ironclad, The Hangover Part II and The Ides of March. In 2012, Giamatti became the voiceover actor for Liberty Mutual insurance commercials. He was the narrator for the PBS Nature episode An Original DUCKumentary. Giamatti produced and starred in John Dies at the End, which is based on the book of the same name. He also had roles in the film Rock of Ages and Cosmopolis. In 2013, Giamatti returned to his alma mater, Yale University, to perform the title role in Shakespeare's Hamlet, for which he won rave reviews in a sold-out, modern dress stage production of the play at the Yale Repertory Theatre, in New Haven. He also had supporting roles in several movies, including the animated film Turbo, The Congress, Parkland, Saving Mr. Banks, and the critically acclaimed 12 Years a Slave. And, Giamatti played the role of New Yorker Harold Levinson, the brother of Cora, the Countess of Grantham (Elizabeth McGovern), in the 2013 Christmas special of the period drama, ITV Studios/Carnival Films television series, Downton Abbey. In 2014, Giamatti played villain The Rhino in The Amazing Spider-Man 2. Also in 2014, Giamatti portrayed psychologist Eugene Landy in the Brian Wilson biopic Love & Mercy. In 2015, he played a scientist in the disaster film San Andreas. He portrayed manager Jerry Heller in the biographical drama Straight Outta Compton, released in August 2015. In the spring of 2016, Giamatti began appearing in commercials for Prism TV, the IPTV service owned by CenturyLink; the spots are the first-ever on-camera TV commercial appearances for Giamatti. Giamatti plays a lead role as a New York City prosecutor in the Showtime series Billions, portraying the U.S. Attorney for the Southern District of New York. The show, debuting in 2016, is loosely based on a real event. Giamatti resides in the Brooklyn Heights neighborhood of Brooklyn, New York and has been married to Elizabeth Cohen since 1997. They have a son, Samuel Giamatti, known as "Sam" (born 2001), who is raised in Elizabeth's religion of Judaism. Giamatti identifies as an atheist. 2001 Storytelling Toby Oxman Todd Solondz Segment: "Non-Fiction"
1994 NYPD Blue Man in Sleeping Bag Episode: "You Bet Your Life"
1995 New York News Dr. Wargner Episode: "Past Imperfect"
1996 Show, TheThe Show Jeffrey Roffman Episode: "Pilot"
1998 Homicide: Life on the Street Harry Tjarks Episode: "Pit Bull Sessions"
1999 American Experience Narrator Episode: "New York: Part V - Cosmopolis"
Episode: "It's Not Easy Being Green"
2005 Saturday Night Live Himself (host) Episode: "Paul Giamatti/Ludacris featuring Sum-41"
2010 30 Rock Ritchie Episode: "When It Rains, It Pours"
2013 Downton Abbey Harold Levinson Episode: "The London Season"
↑ Pringle, Gill (November 27, 2007). "Paul Giamatti: Mr Potato face". The Independent. UK. Retrieved November 27, 2007. ↑ "–Ai. Bartlett Giamatti Marries Ton! Smith". The New York Times. June 19, 1960. Retrieved May 22, 2010. ↑ Reston, James (1997). Collision at Home Plate: The Lives of Pete Rose and Bart Giamatti. Nebraska: U of Nebraska Press. pp. 15–16. ISBN 0-8032-8964-2. ↑ Burkeman, Oliver (November 12, 2009). "G2: 'I'm clearly not Brad Pitt': Paul Giamatti tends to play moody defeatists and rageful misanthropes. Which is just the way he likes it.". The Guardian. Retrieved March 26, 2011. ↑ "Paul Giamatti Emmy Award Winner". Emmys.com. Retrieved 2014-08-03. ↑ craveonline (2007-09-07). "Paul Giamatti's Good Times". Craveonline.com. Retrieved 2014-08-03. ↑ "Win Win". Rotten Tomatoes. Retrieved March 12, 2011. ↑ "Liberty Mutual Press Release". Libertymutualgroup.com. Retrieved 2014-01-25. ↑ "Watch An Original DUCKumentary Online | Full Episode | Nature". PBS. Retrieved 2014-01-25. ↑ "Marshall Fine: Onstage: Paul Giamatti in Hamlet". Huffingtonpost.com. 2013-04-10. Retrieved 2014-01-25. ↑ Kit, Borys (February 23, 2012). "Paul Giamatti, Samuel L. Jackson Join DreamWorks Animation's 'Turbo' (Exclusive)". The Hollywood Reporter. Retrieved February 24, 2012. ↑ "ScreenRant". screenrant.com. Retrieved 26 July 2012. ↑ Archived January 4, 2014, at the Wayback Machine. ↑ Kit, Borys (January 28, 2013). "Paul Giamatti in Talks to Play The Rhino in 'Spider-Man 2' (Exclusive)". The Hollywood Reporter. Archived from the original on January 28, 2013. Retrieved January 28, 2013. ↑ Gianatasio, David (March 1, 2016). "Ad of the Day: Paul Giamatti Battles a Family of Movie Buffs in His First Ads Ever". www.adweek.com. Adweek. Retrieved 8 May 2016. ↑ Orden, Erica. "Manhattan U.S. Attorney Preet Bharara's Office Gets Hollywood Treatment in Showtime Series". Wall Street Journal. ISSN 0099-9660. Retrieved April 11, 2016. ↑ Hale, Mike. "Film", The New York Times. July 29, 2007. Retrieved November 29, 2007. ↑ "Paul Giamatti - 35 Pierrepont Street". The Real Deal New York. February 2, 2016. ↑ Jon Weisman. "Paul Giamatti on Nat Geo's 'Breakthrough': Actor Embraces Inner Geek - Variety". Variety. Wikimedia Commons has media related to Paul Giamatti.